Hillary Clinton refused to disclose how much money Goldman Sachs’ chief executive invested in her son-in-law’s fund, ignoring questions from The Intercept during a photo-op fundraising event in San Francisco. 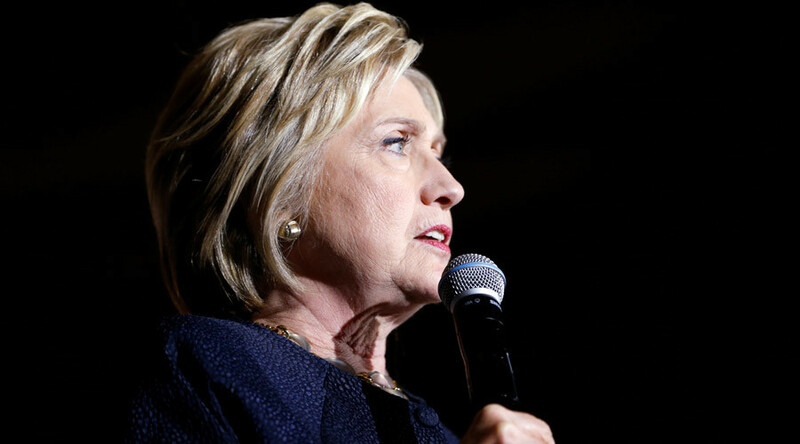 The publication’s reporter, Lee Fang, visited Clinton’s campaign rally in San Francisco on Thursday, as she kept busy touring California to raise last minute support ahead of the crucial June 7 primary. As the former secretary of state was doing photo ops, Fang jumped in with his question. In fact, he peppered her with the question, but Clinton chose not to pay any attention at all, staying focused on picture-taking with her supporters. Moments later, Clinton’s campaign traveling press secretary Nick Merrill stepped in, but he was unable, or unwilling, to help when asked the same question. “I don’t know, has it been reported?” Merrill responded, before promising to “email it right now” once Fang handed off his contact information. Merrill has yet to follow up, according to Fang. Eaglevale Partners LP, founded by Marc Mezvinsky, husband of Hillary’s daughter Chelsea Clinton, and his two partners, has been supported with investments from several wealthy names of Wall Street, including Goldman Sachs chief executive Blankfein. The CEO also allowed the use of his name in the marketing of Mezvinsky’s flagship fund, which is currently managing about $330 million. However, despite having Blankfein by his side, Mezvinsky and his fund suffered losses linked to an ill-timed bet on Greece’s economic recovery. It was reportedly the Clinton’s son-in-law, who recommended his investors to put their money behind Greek government bonds, betting that the Greek economy would improve. In February 2015, the Wall Street Journal broke the news that Eaglevale admitted in a letter to its investors that it was “incorrect” on Greece. According to the newspaper, the dedicated Greek fund also included an investment from Marc Lasry, a longtime Clinton donor, who formerly employed Chelsea Clinton at his $13.3 billion New York hedge-fund firm, Avenue Capital Group. After losing 90 percent of its value, Mezvinsky was forced to close the Greece-focused fund called Eaglevale Hellenic Opportunity earlier this year. According to The New York Times, the fund raised $25 million from investors in order to buy Greek bank stocks and government debt. Goldman Sachs is known to have cozy financial relations with the Clintons, including the company’s paying $675,000 in personal speaking fees to Hillary Clinton as well as $1,550,000 to Bill Clinton for the same service. Donations between $250,000 and $500,000 were also made to the Clinton Foundation, The Intercept reported. The publication has been trying to find out whether Hillary Clinton is going to release the transcripts of her paid speeches to Goldman Sachs. Fang is reported to have been the first to pose that question in January, but four months later, the likely Democratic nominee for president only laughed and turned away. Throughout her campaign, Clinton has been repeatedly called upon to disclose her relationships with Wall Street banks, but she has so far avoided giving direct answers.